I've been waiting all week for this! My kids gave me some awesome material to share!! As a tip, if you have trouble remembering what your kids say, email it to yourself right away or text it to yourself like I do. If you would like to participate, just make sure you follow "the guidelines" and link up! I loved reading the Funnies last week and almost spit my coffee out on the computer!! I still chuckle every time I think of Jaimie's boys "dinner table conversation", the Gomez family's "little meatball" and Mindy's sons method of "finding money in mom's purse!" Oh my word. If you didn't get a chance to read the link ups last week, make sure you go visit! They are good ones! We took the girls to see Toy Story 3 in the theater (and took out small personal loan to do so), and as we were leaving the girls saw the ad for "Despicable Me." Skylar said, "Oh look! It's Spectacle Me!" Reagan: "No Skylar, it's Respectable Me!" I said, "Actually, it's Despicable Me." Reagan said, "Oh great, you're going to put that on the blog aren't you?" HA! She's on to me!! My mom has been coming up about twice a week to go to the chiropractor just down the street from us. When she was here the other day Bailey asked her, "You go see the firecracker?" One morning Skylar woke up and said, "MOMMY! Did you know that Yaya (my mom) was on Dancing with the Stars?" I said, "Really?" "Yah, but she got eliminated." Quite the imagination! We were sitting at a red light and then it turned green. From the backseat Bailey yells "Go buddy go!" to the truck in front of us. I have no idea where she heard that! Skylar brought me a plate of unifix cubes when they were playing restaurant one day and I asked, "What is this baby?" She put her hand on her hip, rolled her eyes and said, "use your 'magination mommy." Reagan said last night, "Did you know that black widow females eat the males after they mate?" I said, "I did know that." Reagan sat for a few seconds and then said, "I'm glad humans don't do that. I would miss daddy." I told Bailey to go ask daddy for something and she stood at the bottom of the stairs and yelled, "Honey!" I was writing words for Skylar to read and when she got to "fork" she sounded it out and then got all excited because she thought she had got it right. Unfortunately it came out "focker! focker! focker!" I was closing up the house so that we could leave and run errands. I heard one of the dogs barking outside so I said, "Who let the dogs out?!" and Bailey started singing "Who...who.....who...whowho." 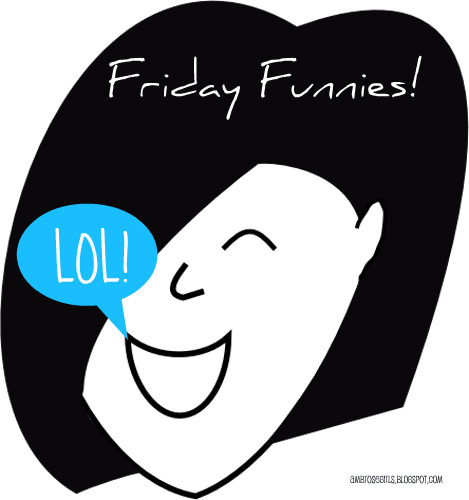 Seriously Heather- these were BY FAR the best Friday Funnies EVER!! I can just hear the conversations as you type...good stuff! Seriously....hilarious!! I love reading these! Funny :) Love the first one and the balls on the water too :) I am still trying to remember mine and need to write them down sooner! Aaron and I were rolling when we read these! Awesome! Especially about Jesus' balls and the spider one. Thanks for a good laugh today!